wHY architecture – an architects office based in Culver City, Los Angeles, California, United States – win this important international architecture competition. 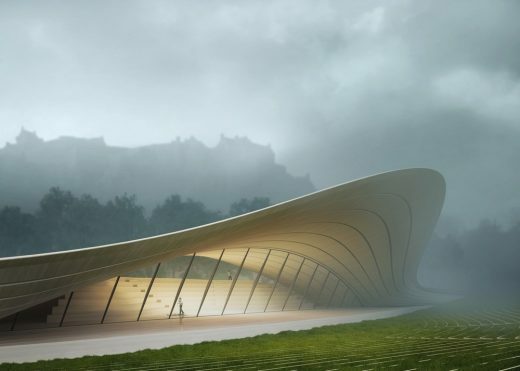 Their design dubbed “The Hobbit House” has won the contest to create a new outdoor concert arena for Edinburgh to replace the Ross Bandstand. 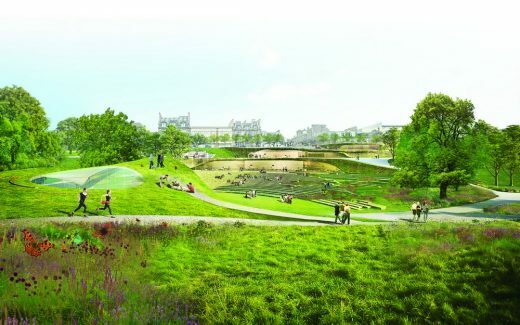 American firm wHY beat off competition from 125 teams from 22 countries to design the £25m project to revitalise West Princes Street Gardens. 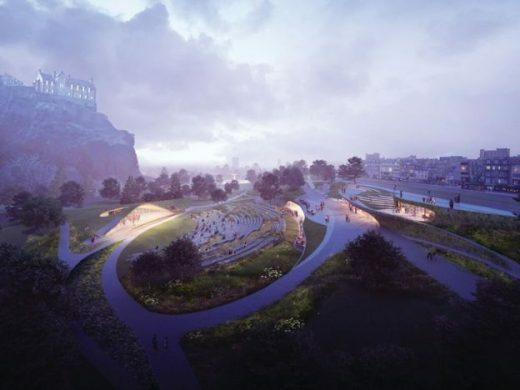 The design will see a series of new green spaces connected by an undulating promenade linked to the Royal Mile. Norman Springford, competition jury chairman, said he was delighted with the whole process. He said: “As is always the case with initiatives of this size and stature, the jury had a hard job. 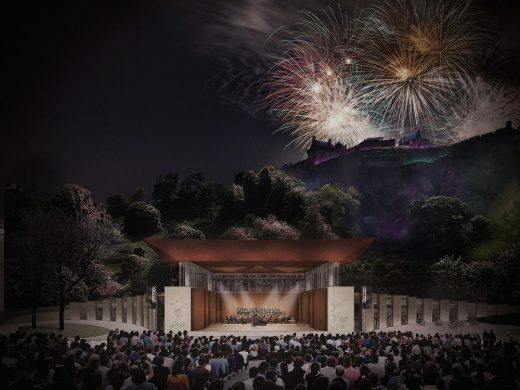 “We are confident, however, that we have a winning concept that embodies an imaginative ensemble landscape approach, creating a wonderful stage for our iconic Edinburgh Castle. 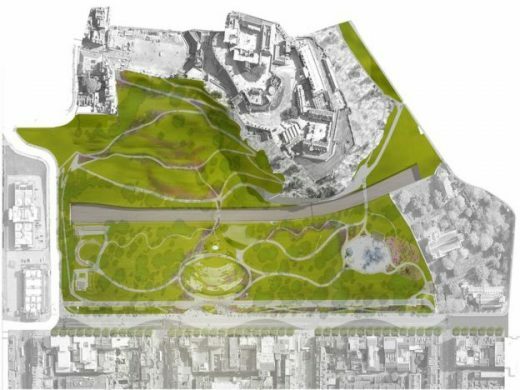 “In addition, the design concept offers a creative energy and a series of unique elements which will all combine to create a new and contemporary landscape. ‘We thoroughly enjoyed meeting all the shortlisted teams and understanding each approach. 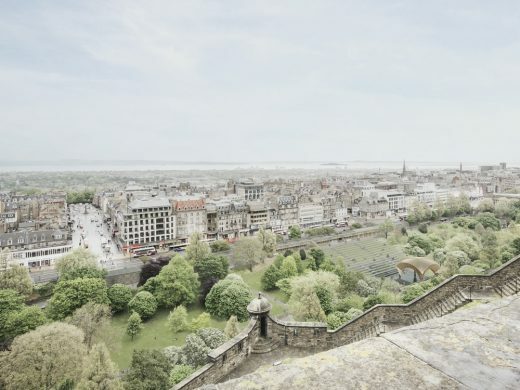 “However with wHY, they demonstrated an impressive collaboration which respects and enhances the historical context and backdrop of the castle and the city, whilst creating new heritage and increasing the green space within the gardens. Kulapat Yantrasast, founder and creative director of wHY, said: “wHY is built around an ecology of disciplines, the convergence of ideas, experience, nature and people. 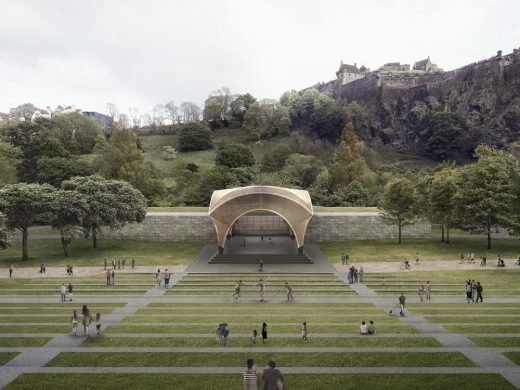 “The Ross Pavilion and West Princes Street Gardens represent this convergence and this was the perfect ground to further our approach to design. To be selected from so many extraordinary thinkers is an honour. 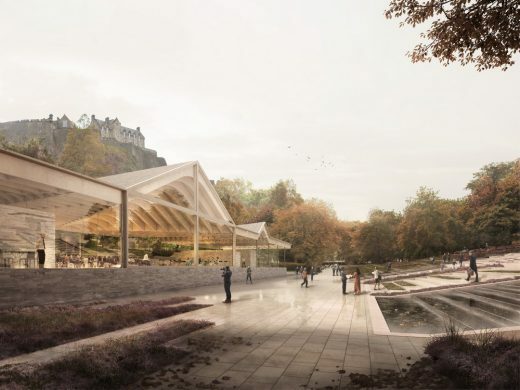 The seven diverse proposals from the teams vying to win the Ross Pavilion International Design Competition and revitalise West Princes Street Gardens now go on show to the public. 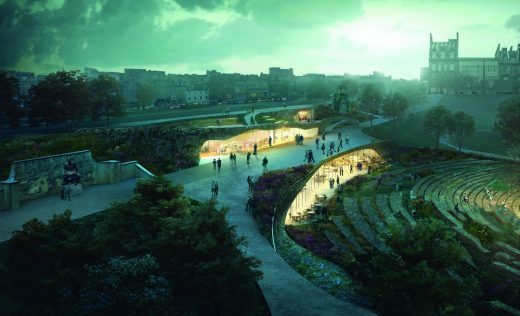 The Ross Development Trust in collaboration with the City of Edinburgh Council today [20 June 2017] revealed the seven concept designs devised by international and UK teams for a new landmark Ross Pavilion, which is intended to revitalise Edinburgh’s West Princes Street Gardens, one of the city’s most emblematic places. 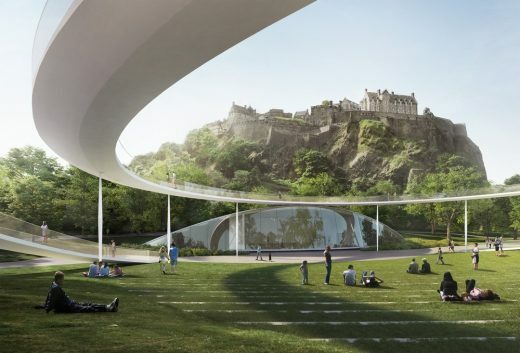 The site for the new Pavilion is a nationally-important space, perfectly positioned below Edinburgh Castle and adjoining the city’s most famous shopping street. Currently occupied by the Ross Bandstand, this is a true ‘place for people’ – for much of the year a tranquil haven, it is also the seasonal focus for some of Scotland’s most high-profile events and celebrations, notably Hogmanay and the Edinburgh International Festival’s closing fireworks concert. 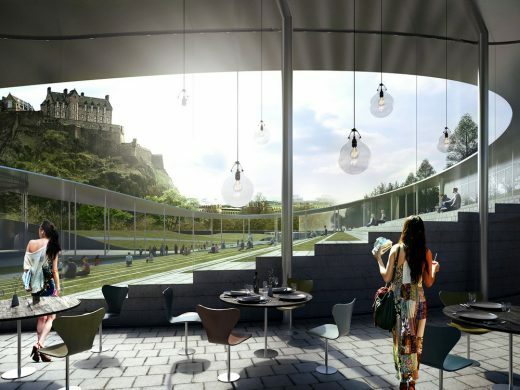 Norman Springford, Chairman of the Ross Development Trust and Competition Jury Chair, said: The revival of this, one of Edinburgh’s best and most prominent sites, is a hugely exciting prospect and we now have seven fascinating design concepts from some of the world’s most in-demand creative minds. These design concepts help us visualise how the new Ross Pavilion could both complement and act as a counterpoise to the Gardens and the Castle. The concepts will now be assessed in detail, the public will get their chance to comment, and then the jury will interview the teams and review and debate each submission in turn. 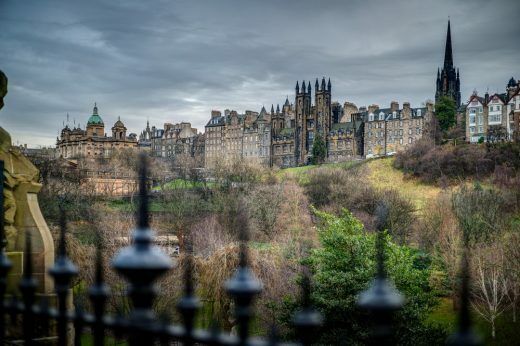 Edinburgh’s Lord Provost, Frank Ross, said: The global response to the competition reaffirms the worldwide interest a city like Edinburgh commands. It really is exciting to see the possibilities for the Ross Pavilion unfold and on display in the City Art Centre. We welcome all thoughts and comments from our citizens on the shortlisted schemes. 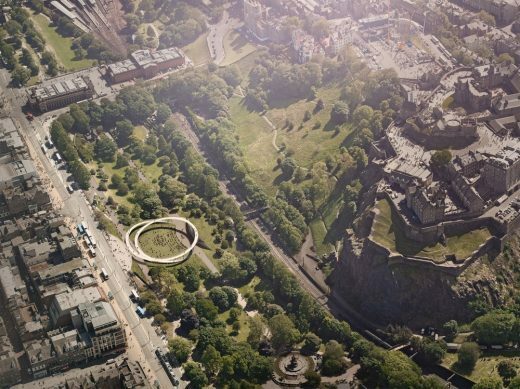 One of these designs is set to become one of Edinburgh’s most important new venues. 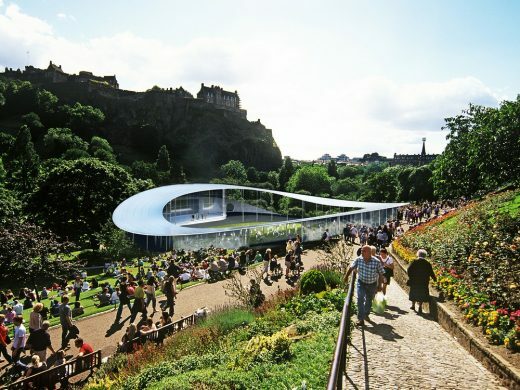 Malcolm Reading, Competition Director, said: Such was the appeal of the project that the competition brought the global design community to Edinburgh! Each of the finalists knows winning would be both a privilege and a careerdefining moment. While the seven Pavilions show different approaches, the competing teams are connected by a shared love of materials, form and placemaking. Of course, these are concepts, and not final designs – the winning team will work closely to develop their ideas with the City Council and the Ross Development Trust. 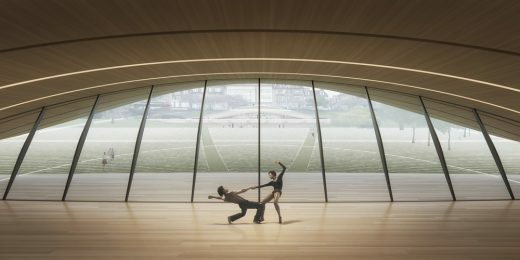 The seven-strong shortlist that reached the second stage of the Ross Pavilion International Design Competition was selected from the 125 teams (made up of 400 individual firms) who entered the competition. 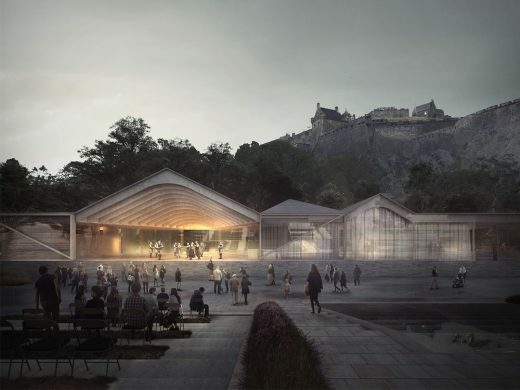 The Pavilion, which will provide a flexible platform for the imaginative arts and cultural programming that Edinburgh excels in, will allow visitors and residents to engage with a variety of events all year round. 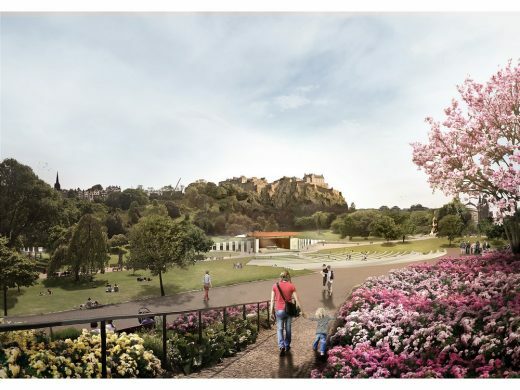 Other aspects of the circa £25m project include subtle updates to the West Princes Street Gardens – the latter being of outstanding cultural significance and operated and managed by the City of Edinburgh Council as Common Good Land. 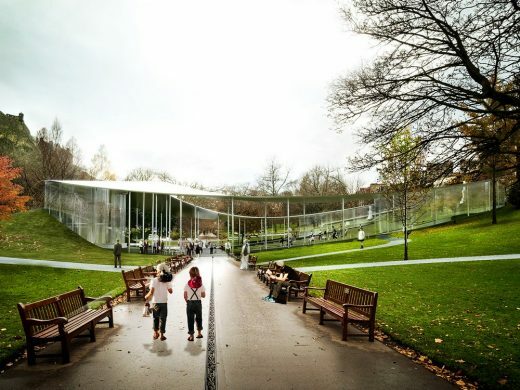 The public is being invited to share its views on the project via a survey at the exhibition or by emailing the competition organisers, Malcolm Reading Consultants, at rosspavilion@malcolmreading.co.uk. The jury, which includes Alexander McCall Smith CBE, FRSE, Sir Mark Jones FSA, FRSE along with Andrew Kerr, CEO, City of Edinburgh Council and Adam Wilkinson, Director of Edinburgh World Heritage (see Notes to Editors for full list), will subsequently meet to interview the teams and the winner announcement is expected in early August 2017. 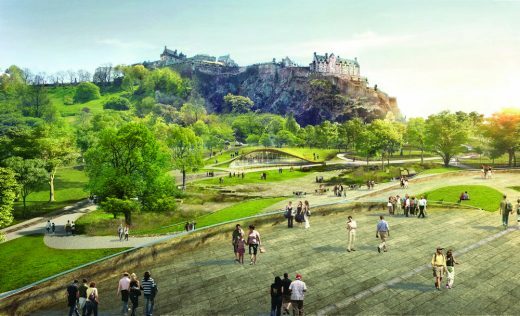 Established in 2016, the Ross Development Trust is a Scottish Charitable Incorporated Organisation whose purpose is to advance the appreciation and promotion of the arts, culture and heritage within West Princes Street Gardens and, through this, encourage the rejuvenation of Edinburgh city centre. The competition is being run according to EU procurement guidelines and the Public Contracts (Scotland) Regulations 2015. It is independently organised by Malcolm Reading Consultants (MRC). MRC specialises in work for museums and arts, heritage, and non-profit organisations and is currently running competitions for the National Infrastructure Commission, the Kaunas M.K. Čiurlionis Concert Centre, the UK Holocaust Memorial Foundation and the National Trust. 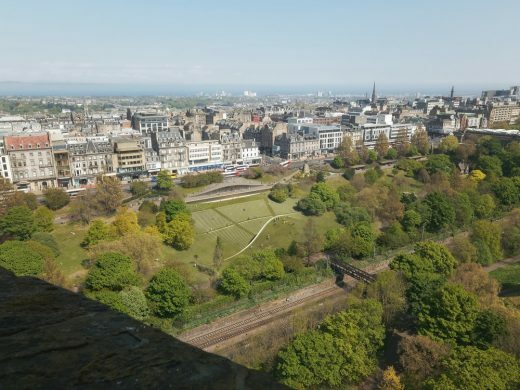 The Ross Development Trust in collaboration with the City of Edinburgh Council and Malcolm Reading Consultants announced today [28 March, 2017] the seven finalist teams who will proceed to the second stage of the Ross Pavilion International Design Competition. The decision of the selection panel – which included representatives of the jury, the Ross Development Trust and competition organisers, Malcolm Reading Consultants – was unanimous. “We were absolutely delighted by the response of designers from around the world to the competition’s first stage. 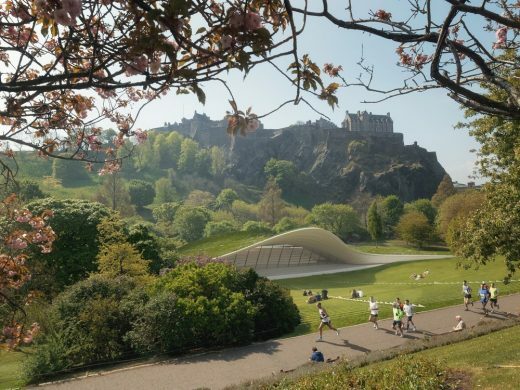 The quality of the 125 teams on the longlist sent a strong signal that the international design community regards this as an inspirational project for Edinburgh that has huge potential to reinvigorate this prestigious site. 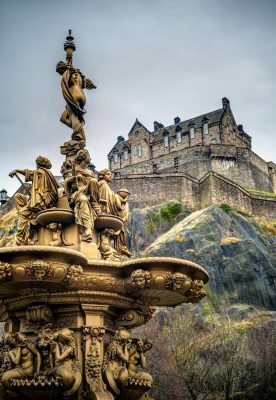 “The response to the competition’s first stage affirms the worldwide interest in Edinburgh and its association with the arts. 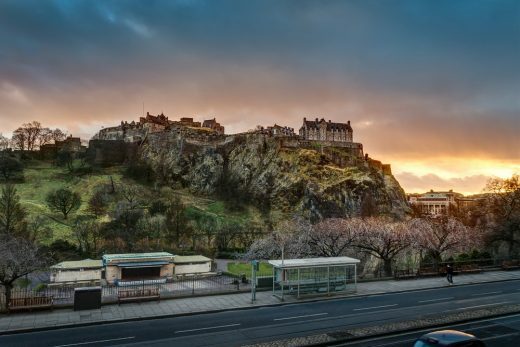 Scotland’s capital is renowned as the World’s Festival City and the home of culture – and designers clearly want to be part of its future. 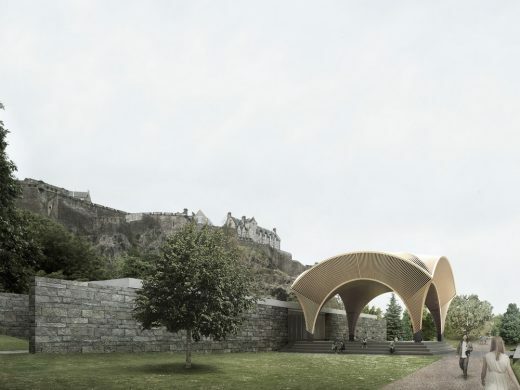 An open day for the finalists will be held in April and the teams will have until 9 June 2017 to produce their concept designs for a new landmark Pavilion, a visitor centre with café, and subtle updates and improvements to the listed Gardens, which are of outstanding cultural significance and operated and managed by the City of Edinburgh Council as Common Good Land. The Pavilion will host the kind of imaginative arts programming which Edinburgh excels in, from large to small scale events. A public and digital exhibition will be held in mid-June and will allow for local, national and visitor feedback. The jury will subsequently meet to interview the teams and the winner announcement is expected in early August 2017. At the competition’s first stage, 125 applications were received from 22 different countries, including Australia, Japan, India and the United States, with UK-based practices producing 42 per cent of responses. Joining the competition jury will be Ada Yvars Bravo, Director, MYAA Architects; Sir Mark Jones FSA FRSE, former Director of the National Museums of Scotland and the Victoria and Albert Museum; Riccardo Marini, Director, Gehl Architects; Alexander McCall Smith, writer; Malcolm Reading, Architect and Competition Director; and Norman Springford (jury chair), Chairman, Ross Development Trust. Additional jury members, including an elected City of Edinburgh Council member (pending the upcoming local elections) will be announced later in the competition process. 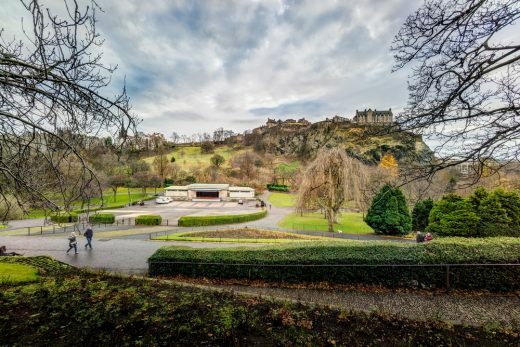 The initiative will regenerate and renew a nationally-important space at the heart of West Princes Street Gardens and within the Old and New Towns of Edinburgh UNESCO World Heritage site. 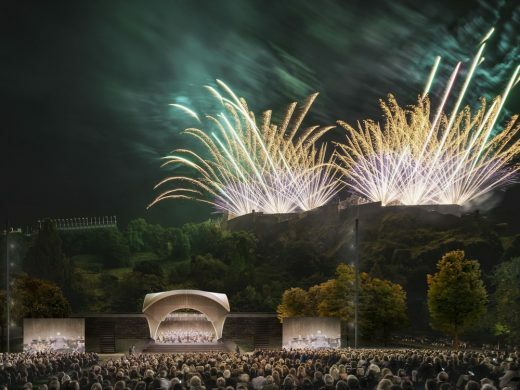 It is the rallying point for some of Scotland’s most high-profile events and celebrations, notably Hogmanay and the Edinburgh International Festival’s closing fireworks concert. The site is presently occupied by the Ross Bandstand. The competition is being run according to EU procurement guidelines and the Public Contracts (Scotland) Regulations 2015. It is independently organised by Malcolm Reading Consultants (MRC). MRC specialises in competitions for museums and arts, heritage, and non-profit organisations and is currently running the Clandon Park International Design Competition for the National Trust. Adjaye Associates was established in June 2000 by founder and principal architect Sir David Adjaye OBE. Receiving ever-increasing worldwide attention, the firm has offices in London and New York and completed work on four continents. Two of the practice’s largest commissions to date are the design of the Smithsonian Institution’s National Museum of African American History and Culture on the National Mall in Washington D.C. and the Moscow School of Management (SKOLKOVO). Projects range in scale from private houses, exhibitions, and temporary pavilions to major arts centres, civic buildings, and masterplans. Renowned for an eclectic material and colour palette and a capacity to offer a rich civic experience, the buildings differ in form and style, yet are unified by their ability to generate new typologies and to reference a wide cultural discourse. For over a decade, BIG Bjarke Ingels Group has been building a reputation as one of the most creative and intelligent architecture offices in the world, working for major institutions such as the Smithsonian and companies such as Google. With over 400 employees based in Copenhagen, New York and London, BIG’s projects are widely recognized as sophisticated design solutions that create dynamic community spaces and innovative forms. BIG’s buildings have been successful on many levels, winning prestigious international awards for architecture, landscape, and urban design, while achieving programmatic, budget and schedule goals. Significant projects in their cultural portfolio include the Serpentine Pavilion for Summer 2016, the Danish Maritime Museum, a museum come to life in an abandoned dry dock in Helsingør, Denmark and 2015 Mies Van Der Rohe Finalist, and their ongoing work with the Smithsonian Institution in Washington, DC. Flanagan Lawrence and their team of Arup, Expedition, Gillespies and JLL have developed considerable experience and expertise based on a number of award-winning performing arts projects, delivered in highly sensitive historical contexts. These include the Royal Welsh College of Music and Drama in Cardiff, the Acoustic Shells in Littlehampton and the innovative Soundforms Mobile Acoustic Performance Shell which were led by Jason Flanagan of Flanagan Lawrence Architects. Our team includes Expedition Engineering and Arup, with whom Flanagan Lawrence collaborated on the design for the refurbishment of the Szczecin Amphitheatre in Poland. 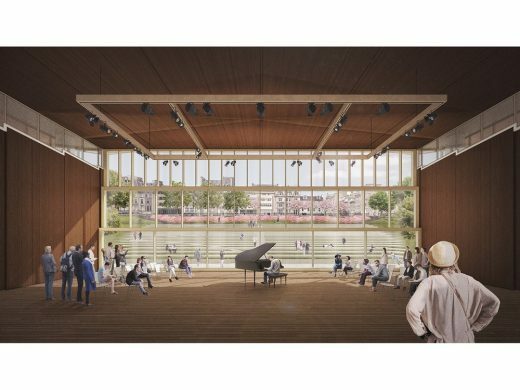 We are currently working with JLL on the planning of a new Music Centre at St Andrews University on a complex historic site beside St Mary’s Quad. 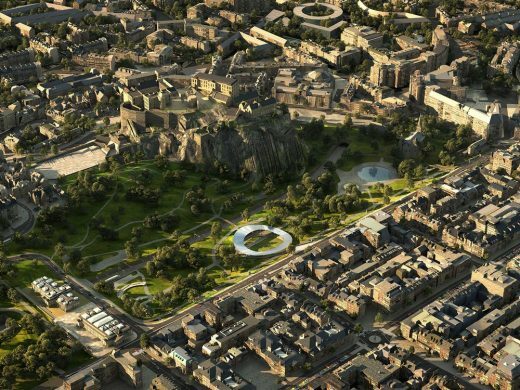 Gillespies’, our landscape architect, are an award winning practice who delivered the recent works to St Andrew Square. Page \ Park Architects have teamed up with Rotterdam based West 8 landscape architects and global engineering firm BuroHappold to create a team of local, national and international practitioners for this exciting opportunity. As one of Scotland’s leading practices Page \ Park Architects, currently restoring the Mackintosh building for the Glasgow School of Art has a reputation for contemporary interventions within sensitive historic settings, coupled with a strong portfolio of performance venue experience including the refurbishment of Kelvingrove Bandstand and Amphitheatre in Glasgow. Acclaimed landscape architects West 8 with a proven track record of world class projects such as Jubilee Gardens and BuroHappold bring their global expertise and innovation to the civil / structural and services engineering. This tripartite arrangement is supplemented by specialists venue consultants Charcoalblue and planning consultant Muir Smith Evans. Reiulf Ramstad Architects is an independent Oslo-based architectural firm with a high level of expert knowledge and a distinct ideology. The firm has a strong conceptual approach combined with experience from past accomplished projects. Over the years RRA has produced a wide range of innovative and ground breaking projects with an exceptional variation of scale and program. RRA have earned a reputation for creating bold, simple architecture with a strong connection to the impressive Scandinavian landscape. Notable completed projects in Norway include the Trollstigen Visitor Centre, Romsdal Museum and Selvika National Tourist Route. The firm has shown a multitude of approaches in solving assignments, both nationally and internationally and has received numerous awards for its projects. These include Architizer Firm of the Year 2015, The International Architecture Award for 2013 for Trollstigen and three nominations for the European Union Prize for Contemporary Architecture – the Mies van der Rohe Award. 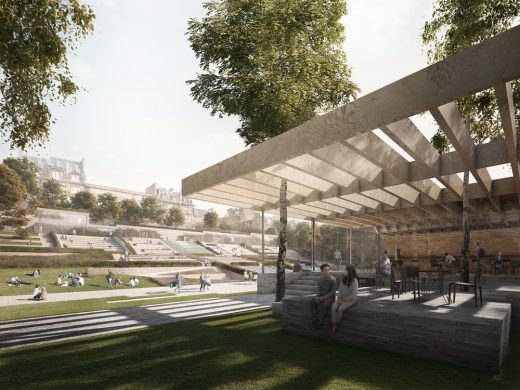 Sou Fujimoto Architects and William Matthews Associates are delighted to be shortlisted for the Ross Pavilion International Design Competition. Sou Fujimoto Architects is an international studio established in 2000, based in Tokyo, and at the forefront of architectural design. In 2013 Fujimoto became the youngest architect to design a Serpentine Pavilion. The practice has since won design competitions in France, Hungary and Taiwan. William Matthews Associates is an emerging London based practice established in 2013. 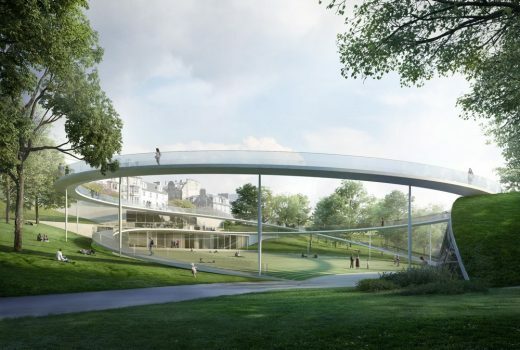 In 2016 the studio, in collaboration with Ney & Partners, won the Tintagel Footbridge competition. Prior to establishing the firm William worked with Renzo Piano for 19 years. During this time he led the design team of the Shard mixed use tower in London. 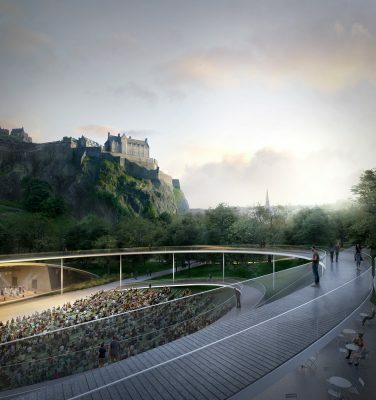 Our team for the Ross Pavilion is completed by four leading consultants based in Edinburgh: GROSS. MAX. (landscape architects), BuroHappold (engineering services), Purcell (heritage consultant) and Scott Hobbs (planning consultant). 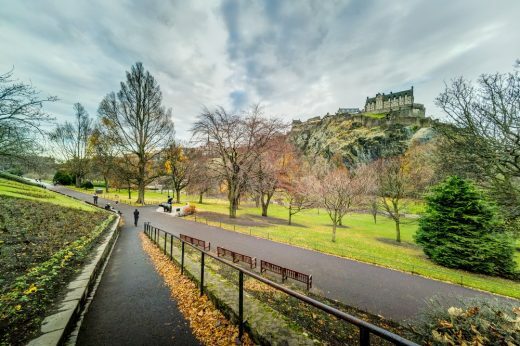 The Ross Development Trust is a Scottish Charitable Incorporated Organisation, registered as a Charity in Scotland, and constituted to deliver significant regeneration in West Princes Street Gardens. 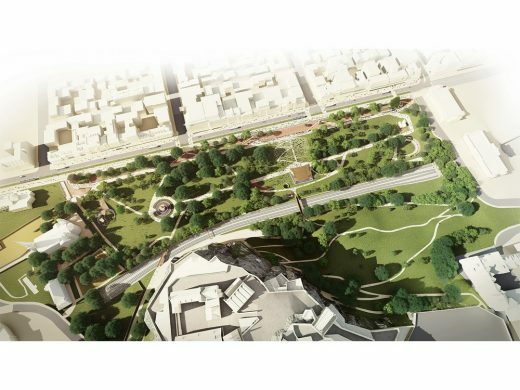 The Trust is tasked with finding the capital required to fund the various projects within the Gardens, for the benefit of the City. MRC is the leading specialist in design competitions in Europe. Recent work includes competitions for the National Trust, the Illuminated River Foundation, the Museum of London, the gold medal-winning UK Pavilion at Milan Expo 2015, the Solomon R. Guggenheim Foundation, Tintagel Castle Bridge, Queen Elizabeth Olympic Park’s Culture & Education Quarter, the Mumbai City Museum, the Natural History Museum and New College, Oxford. 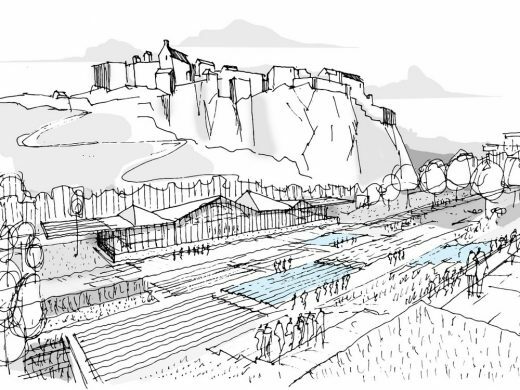 The Ross Development Trust in collaboration with the City of Edinburgh Council and Malcolm Reading Consultants today [February 9, 2017] launched a global search for an outstanding team of architects, landscape designers, engineers and other specialists for the new circa £25m Ross Pavilion and Gardens project in the heart of Edinburgh.